Thanksgiving for me is about comfort food and sticking with tradition, maybe throwing in a new twist here and there to keep it interesting. I didn't cook Thanksgiving this year, and in fact, except for one year, I have never been responsible for hosting the holiday. Generally, I volunteer to bring a dessert, since I feel like dessert should always be homemade on Thanksgiving. I've eaten my fair share of grocery-store bought pie, and it just doesn't cut it. I started making pumpkin pie around 17 years old, and that's always a staple. This Thanksgiving, I made a pie that I first tested last year at a pie contest in Brooklyn that I think I'll be adding to my list of traditions (for the record, I heard it came in the Top 10). It's a pretty simple recipe, with pears and a crumble top mixed with shredded Gruyere cheese, and a dash of Cayenne pepper for some unexpected heat. In my opinion, you'll always need pumpkin pie at the table, but this is a pie you'll always want at the table once you give it a try. 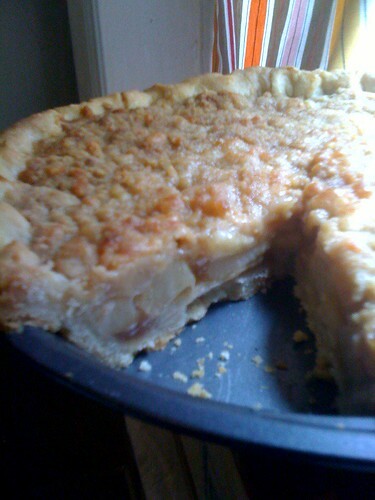 Pear Pie with Gruyere Crumble This recipe is more of a blueprint than a recipe. Vary the types of cheese. vary your spices, or if you want add additional fruit. Toss sliced pears with lemon juice in a large bowl. Mix in the mixture of brown sugar, cornstarch and cinnamon in a separate bowl, then mix into the pears until evenly coated. Set aside. Roll out the pie dough (homemade is best), into a 9 inch pie plate. Fill the pie with the pear mixture. 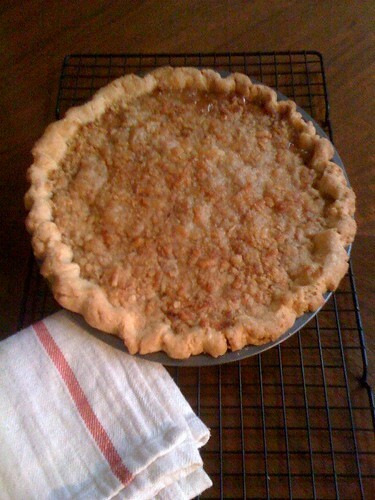 Set in refrigerator so pie crust can hold its shape while you prep the crumble. Mix all ingredients in a small bowl, then add the butter in with your fingers, until the mixture resembles coarse crumbs. Top the pie with the crumble topping and bake for 45 minutes, or until golden brown. If you wish, in the last 15-20 minutes of baking, sprinkle another 1/4 cup of shredded cheese on top so that it can melt. Let cool on a wire rack before serving.